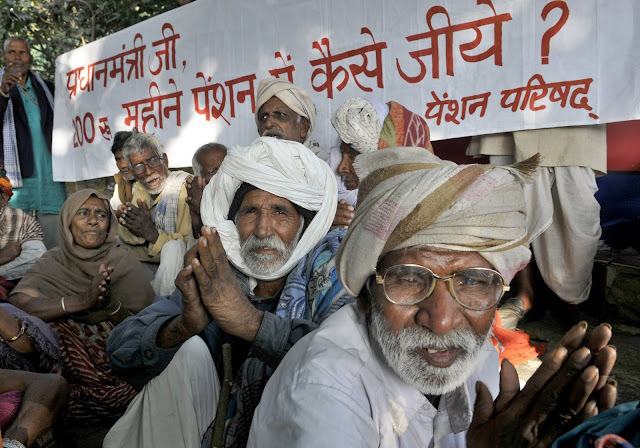 Sixty eminent economists have written to the Union finance minister an “urgent and modest proposal” seeking to increase the Central contribution to social security pensions from the current measly Rs 200 per month to Rs 500 per month, and providing for maternity entitlements of Rs 6,000 per child as prescribed by the National Food Security Act. The central government’s contribution to old-age pensions under the National Old Age Pension Scheme (NOAPS) scheme has stagnated at just Rs 200 per month since 2006. This is unfair. It is also a missed opportunity: NOAPS is a good scheme (with low leakages and administrative costs) that reaches some of the poorest members of society. The central government’s contribution should be immediately raised to Rs 500 (preferably more) at the very least. This requires an additional allocation of Rs 8,640 crore or so, based on the current NOAPS coverage (2.4 crore pensioners). Similarly, widow pensions should be raised from Rs 300 per month to Rs 500 at the very least. This would cost just another Rs 1,680 crore. Maternity benefits of Rs 6,000 per child are a legal entitlement of all Indian women (except those already covered in the formal sector) under the National Food Security Act 2013. For many years, the central government did not act on this. Last year, a scheme was finally launched for this purpose: the Pradhan Mantri Matru Vandana Yojana (PMVVY). However, the provision made for it in the Union Budget 2018-19 (Rs 2,400 crore) is less than one third of what is required based on NFSA norms. Further, in flagrant violation of the Act, PMMVY restricts the benefits to Rs 5,000 for just one child per woman. The Union Budget 2019-20 should provide for full-fledged implementation of maternity entitlements as per NFSA norms. This requires at least Rs 8,000 crore, based on a 60:40 ratio for centre:state contributions (see Annexure). Along with this, the illegal restriction of maternity benefits to one child per woman should be removed. It is also important to streamline payment systems so that pensions and maternity benefits reach the recipients on time every month, e.g. by the 7th day of the month as directed by the Supreme Court in its order of November 28, 2001. We urge you to accept these modest recommendations. 1. In 2013, maternity benefits became a legal entitlement of all Indian women (except those already receiving similar benefits as regular government employees or under other laws) under the National Food Security Act, Section 4: “Subject to such schemes as may be framed by the Central Government, every pregnant and lactating mother shall be entitled to [nutritious food and] maternity benefit of not less than rupees six thousand, in such instalments as may be prescribed by the Central Government”. 2. At that time, a pilot scheme called Indira Gandhi Matritva Sahyog Yojana (IGMSY), with benefits of Rs 4,000 per child, was being implemented in 53 districts. Under IGMSY, maternity benefits are conditional and also restricted to two live births. 3. On 30 October 2015, the Ministry of Women and Child Development filed an affidavit in the Supreme Court, claiming that it was planning to extend IGMSY from 53 to 200 districts in 2015-16 and all districts in 2016-17. Yet, the budget allocation for IGMSY in the 2016-17 Union Budget remained a measly Rs 400 crore (as in 2015-6 and 2014-5), making it impossible to go beyond the 53 pilot districts. 4. The importance of maternity entitlements was well articulated in the Economic Survey 2015-16, in a welcome chapter on “Mother and Child”. However, this was not reflected in the 2016-17 Budget. 5. In April 2016, the IGMSY Rules 2016 were notified. The Rules extend IGMSY (with benefits of Rs 6,000 in two instalments) to all pregnant women for the first two live births. But it seems that this was just a ritual – it had no impact on actual policy. 6. On 31 December 2016, Prime Minister Narendra Modi announced that pregnant women nation-wide would soon be getting maternity benefits of Rs 6,000. 7. Further to the PM’s announcement, an allocation of Rs 2,700 crores was made for “maternity benefit programme” in the Union Budget 2017-18. However, this is a fraction of what is required: universal maternity entitlements of Rs 6,000 per child would require at least Rs 13,000 crore per year (assuming a birth rate of 19 per thousand and an effective coverage of 90%). 8. On 22 February 2017, at a consultation held at Vigyan Bhawan, state governments were told that under the “proposed Maternity Benefit Programme”, maternity benefits would be paid with retrospective effect from January 1, 2017. State governments would have to bear 40% of the costs. 9. On April 3, 2017, the Ministry of WCD stated in an affidavit to the Supreme Court: “…the Government of India has announced pan-India implementation of Maternity Benefit Programme with effect from January 1. 2017 in all the districts of the country. All the pregnant women and lactating mothers would be given Rs 6,000 in instalments [except those already receiving similar benefits as regular government employees or under other laws]”. 10. In a circular dated May 19, 2017, the Ministry of WCD informed the states that the Maternity Benefit Programme had been “approved” and that the guidelines would be “sent shortly”. The circular also mentions that benefits would be restricted to the first live birth – a flagrant violation of the Act. 11. In August 2017, the MoWCD released the guidelines and draft Rules for Pradhan Mantri Matru Vandana Yojana (PMMVY). Under PMMVY, maternity benefits (Rs 5,000 only) are restricted to the first live birth - a flagrant violation of the Act. Conditionalities also apply. 12. One year later, only 37 lakh women had received any maternity benefits under PMMVY ("India Today", September 17, 2018). This corresponds to just 15% or so of all births in one year.